Peanut butter; the most ubiquitous of nut butters, is a slippery beast. Both literally and symbolically. Not being raised on the stuff like most Americans have, we’ve lately been searching for the ultimate peanut butter. There is a laundry list of requirements: all natural, not too thin, not too thick, silky smooth, peanutty but not bland, a little sweetness but not too much. Most of all I wanted to avoid the hydrogenated fats and corn syrup that seems to be present in many brands of commercial peanut butters. Seems that’s a difficult task as we have bought 4 jars of the stuff recently and it’s all been woefully inadequate. I see a lot of satay sauce in my future. Makes between 3/4 and 1 cup. 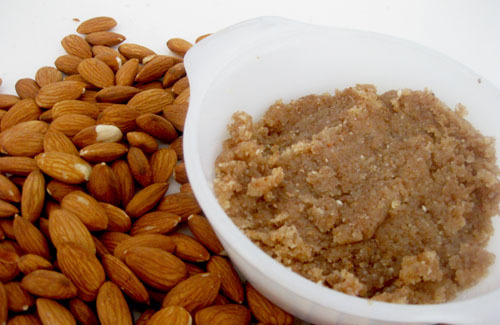 1.5 cups raw unpasteurised almonds. 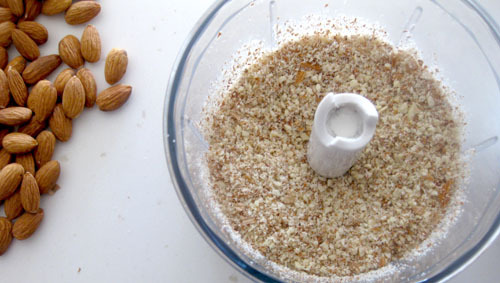 Put the almonds into your food processor and whiz them until they pass grainy and enter into pastey territory. If they are a bit old they might need a dash of oil to get them going. This will take some time – maybe 10 minutes. Once they are a paste (I like mine chunky) taste and add salt and sugar to your palates requirements. I find I only need a small amount of both. Store in the fridge. It doesn’t last for long so don’t make a giant batch unless you’re going to eat it within the next couple of weeks.